There are over 200 million active Twitter users which means there are plenty of people to choose from. Just because someone has a good follow back ratio does not mean you should follow that person. There are many people with good follow back ratios which means you want to choose the best ones possible. In addition, the fact that someone may not be following you back is not always the right reason to unfollow that individual. There are some Twitter users who follow almost no one, but some of these users are getting thousands of new followers every week. That means not all Twitter user is created equal. 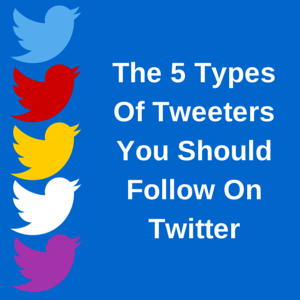 Some are better than others for your tastes, and here are the five types of tweeters that you in particular should follow. No matter what niche you are in, there are certain individuals who stand out from the crowd. These are the leaders of your niche, the ones who many people aspire to become. Maybe you aspire to be just like some of these leaders. In most cases, the leaders of a particular niche know more about that niche than anyone else. That means if you follow them, you are going to learn a lot of information about your niche. Even though I have grown an authority on the web, I am still following the leaders of my niche and learning from them. I am writing blog posts that go more in depth on certain topics because it helps SEO. I am writing numerous books because that is a great way for self-published authors to bring in a full-time income. No matter how much you know about your niche, there will always be someone who knows something about your niche that you do not know. Following the leaders of your niche will allow you to get closer to knowing everything about your niche. Anyone who is interested in your niche is a like-minded person who you can potentially build a strong connection with. When you follow these people, and they have good follow back ratios, they will be very likely to follow you back. The great thing about the people who are interested in your niche is that if you tweet your blog posts (and those blog posts are related to your niche), those blog posts will get more engagement than usual. Some of the people who are interested in your niche may even decide to share some of your blog posts. Those are the right followers to have. We all have days in our lives when we nothing seems go to as planned. Whether the technology for something did not work or you experienced a problem in your life, those are the days when we need words of encouragement so we can continue to move forward. That is why it is important to follow motivational people. Make it a point to follow the best motivational speakers on the planet or the Twitter accounts that tweet motivational quotes. Looking through these accounts’ tweets will allow you to regain motivation and continue your day with a more positive attitude. There is always a good time for a laugh. Laughing makes us feel good, and laughing for a long period of time is the equivalent of a short core workout. Not only does laughing strengthen your core, but on days we are feeling sad, a good joke has the power to brighten us up. After putting in hours of work, reading through humorous tweets allows me to take a break where I simply kick back and laugh. I only follow a few humorous tweeters and rarely see their tweets. The logic behind this decision is that when I am visiting one of these accounts, I scroll as far down in those accounts feeds as possible. I may read hundreds of tweets and find them all humorous. Our world is moving incredibly fast, and there are many things happening in society. News outlets allow you to know what is going on in the world. Some of these news outlets cover political events while others discuss animals. There are a variety of options for news outlets, and a great thing about them is that there are many subsets. The Huffington Post is a massive online magazine with sports, animals, teen, New York, and other content categories that turned into Twitter accounts. When I decide whether I want to follow a news outlet, I always look at their most recent tweets. I do not follow the news outlets that only tweet the bad news. I can’t stand it when news outlets constantly tweet about bad news because they make money when you read the article with advertisements, and I like to stay as far away from bad news as possible. I do not want the bad things going on to pollute my decisions, so when I follow a news outlet, I make sure most of the tweets are positive before following. I only follow 1-3 accounts that tweet good and bad news. There are many people on Twitter, but that does not mean you should follow all of them. You do not have to follow someone just because that person is following you, and you do not have to follow someone just to get the follow back. The best way to follow people is by being selective. That way, you will be able to get your desired information. If your feed ever becomes crowded, but you know who you want to see on your feed, you can put the accounts you want to see on your feed into a Twitter list. A Twitter list can either be public or private, and it’s feed only contains tweets from the people you put on the list. If you are following 10,000 people, but you only want to see the tweets from 100 accounts, you can put all 100 accounts on the list to only see those accounts’ tweets. You don’t have to unfollow the other 9,900 accounts to see the 100 accounts that you want to see. Who are the type of people that you follow on Twitter?